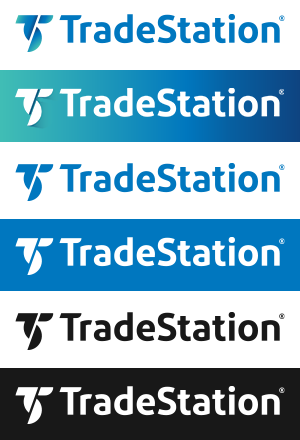 The TradeStation logo is available to authorized technology partners, vendors, media partners and other third parties for use and display in accordance with TradeStation corporate branding policies and guidelnes. TradeStation requires that all third parties adhere to the brand guidelines provided below. For more information about the use of the TradeStation logo, please contact Marketing@TradeStation.com. Ensuring that our corporate communications graphic style is uniform and of high quality is critical to presenting a professional image of the company. These guidelines reflect our commitment to the integrity of the TradeStation brand. Use the unmodified TradeStation logo downloaded from this website. Ensure that there is sufficient clear space between the TradeStation logo and other graphic or text elements. Third parties should never use the logo in a manner that implies an endorsement by TradeStation. Never alter the logo by changing the colors, applying strokes, rearranging, stretching or distorting any elements. Do not place the logo against high-contrast areas in illustrations or photographic backgrounds. All TradeStation brand marks are protected by applicable trademark, copyright and intellectual property laws. By using the TradeStation marks, you agree to follow the guidelines above. TradeStation reserves the right to cancel, modify or change these guidelines at any time and at its sole discretion. When referencing the name of our software application, use TradeStation®. Never use TradeStation in the name of your company, website address, application or product. TradeStation maintains various programs for authorized technology partners. Partners enrolled in these programs (including but not limited to TradingApp Store, EasyLanguage, and API developers as well as vendors and partners of white-labeled solutions) may use the TradeStation brand and trademarks in accordance with the marketing and trademark guidelines established in their partner agreement, and only in conjunction with the appropriate terms that define the relationship authorized by their contract with TradeStation.